We’re partnering with Plaid to make Mixbook photo canvas prints truly custom! It’s the ultimate gift idea for a special someone or a fun way to create a personalized piece of art just for you! 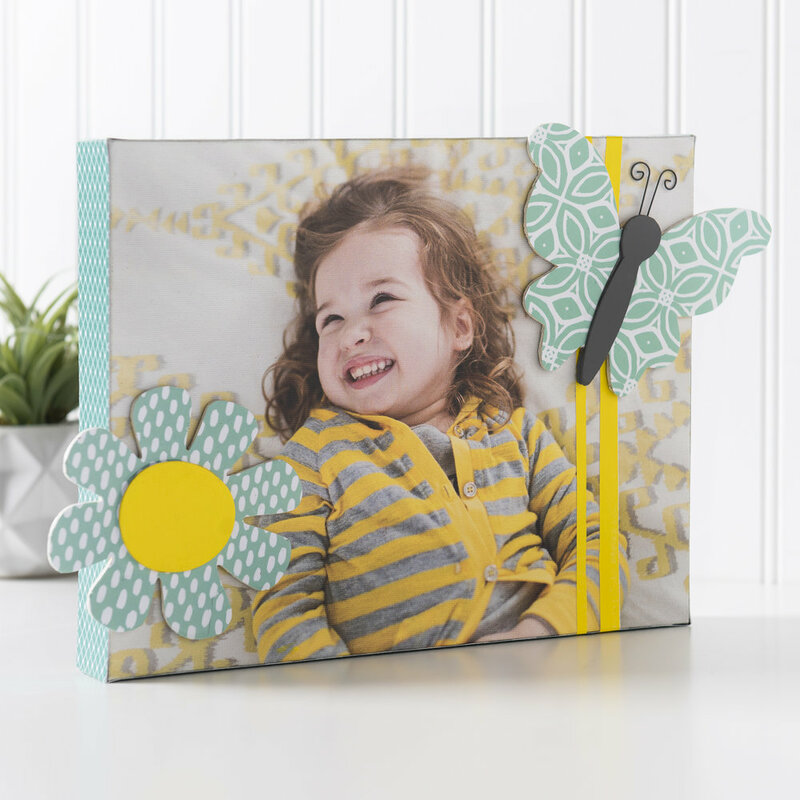 Mixbook photo canvas prints come in several different sizes for the perfect fit, and you’ll find a rainbow of colors in FolkArt to coordinate with your photo to make this easy project. >> 25% off everything at Plaid Online with code MIXBOOKPLAID - shop all things DIY, including Mod Podge, FolkArt and much more! Starts 7/16/2018 and ends 8/31/2018 at 11:59pm ET. >> $25 off new customer orders with Mixbook using code MIXBOOKPLAID. Expires 9/30/18. Wood Shapes of your choice - we used a Flower and Butterfly. 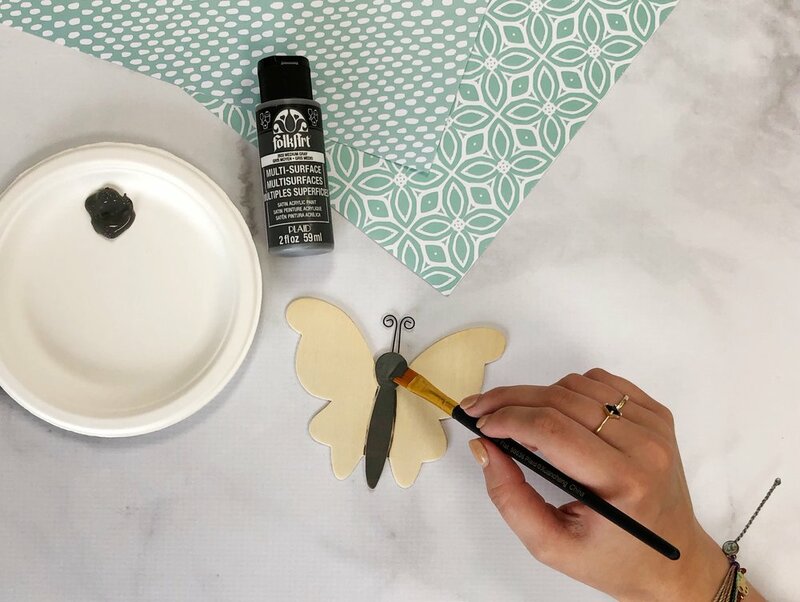 Paint the wood shapes with FolkArt to coordinate with your choice of scrapbook paper. We painted the body of our butterfly Medium Gray and the inside of the wood flower Daffodil Yellow. Allow one hour dry time. Next, trace the outline of each wood shape onto your scrapbook paper. Cut along line. Using Mod Podge Satin, attach scrapbook paper to petals and wings of the wood shapes by putting a thin layer of Mod Podge onto both the surface and the back of the paper. Press out any air bubbles with a squeegee or old credit card. Allow to dry, and finish the top with a coat of Mod Podge Satin. Allow one hour dry time. Hot glue wood shapes to photo canvas. To embellish canvas edges, choose scrapbook paper that compliments the colors within your photo canvas. Cut scrapbook paper into 4 strips that are the same length and width of each edge of the canvas. Glue the strips along the edges of the canvas with Mod Podge Satin and smooth out any air bubbles with the squeegee. Allow to dry. Finish the top with a coat of Mod Podge Satin. We’re in love with how our canvas came out and how easy it is to create! Follow @Mixbook on Instagram, Facebook, and Pinterest, and find more DIY inspiration on Plaid’s Instagram, Facebook, and Pinterest !